I have a problem with Yorkshire pudding that I hope you can help. I put 1/8th of an inch of extra virgin olive oil in the muffin pans, heat the oil up just to the smoking temp then add the chilled batter and bake it for 25-30 minutes. I bake it at 425 degrees for 10 minutes, then lower the temp to 325 degrees for the remaining time. The problem is that they come out like hockey pucks -- 1 inch high, hard on the outside and sometimes pudding-like in the center. They should rise up 3 to 5 inches. What am I doing wrong? Any help would be greatly appreciated. Ah, Yorkshire pudding. The nemesis of many a good cook. 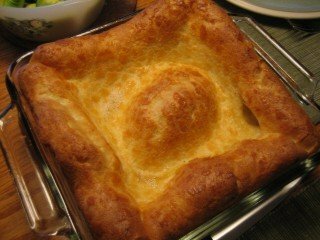 The American equivalent of Yorkshire pudding is the popover which is typically cooked in individual servings using a specially designed popover pan or a muffin tin. Yorkshire pudding may be cooked as individual servings or as one large piece that is cut up to serve. There are a few things that I can suggest you could try to solve your problem, but first a little kitchen science. Steam from the eggs and other liquid, plus air bubbles trapped in the batter, provide the leavening that causes Yorkshire puddings, or popovers, to rise. They rely on protein in the egg and glutens in the flour to form a membranous structure which traps the steam and causes them to inflate. Finally, they depend on the starch in the flour to gelatinize and form the final shape. Milk sugars and fat both help with browning and flavor. The timing of events is critical because the batter needs to still be soft while the steam is forming, but then needs to set fairly quickly while it is inflated. That is why they are cooked at high temperature. Reducing the temperature as they cook allows moisture to escape while the starches gelatinize and the outside browns without burning. So here are some suggestions to improve your success with Yorkshire pudding. First, I notice the proportions in your recipe say 4 eggs to one cup of flour. Assuming you are using large eggs, this is somewhat high. Most recipes use 2 eggs per cup of flour. Too much egg will interfere with the formation of glutens, so you may want to try reducing the number of eggs to two, and increasing the milk to one full cup in order to keep the batter loose. It should be a bit thicker than heavy cream. For altitudes above 3,500 feet (about 1,000 meters) it may be necessary to increase the proportion to 3 eggs per cup of flour (see High Altitude Cooking). In that case, you will also want to reduce any fat in the batter by about 1 teaspoon per cup of flour. In your case, the recipe doesn't use any fat in the batter itself. Many recipes use around 2 tablespoons of melted butter for each cup of flour. Second, depending on where you are located, all purpose flour may have more or less protein in it. It is the protein which forms the glutens needed to trap the steam. Your flour should have about 11% - 12% protein by weight to make adequate glutens (see Flour Power?). You could try using bread flour or a combination of bread and all purpose flour. Also, you could try adding about 1/2 teaspoon of salt per cup of flour. Not only will this enhance flavor, it will help to strengthen the gluten. Next, blend the ingredients together until they are completely smooth and air bubbles start to rise to the top. This is contrary to some popover recipes, but you need to form the glutens, which happens through mechanical action. The air bubbles trapped in the batter will help to inflate the Yorkshire pudding. Most recipes recommend using room temperature ingredients. In fact, one recipe I found even suggested warming the ingredients slightly. The benefit to this is that steam is created earlier, before the outer surface starts to dry out. Try working with room temperature ingredients. If your recipe says to let the batter rest for an hour in the fridge, let it warm back up to room temperature before cooking. In that case, also give it a final mixing before cooking to trap more air, since some will have escaped during resting. The various sources I checked all seem to agree that there is no real need to pre-heat the pan. Simply grease the inside to stop the pudding from sticking, whether you are making one large pan or individual servings. Pour in the batter and cook, as you describe. Some recipes say to turn the heat down immediately once the pudding is in the oven, while others let it run hot for 10 to 15 minutes and then reduce the heat, as you do. Some start with the oven a bit higher, at 450°F (230°C). Cooking times vary between about 30 and 50 minutes. One final hint is to not use convection when cooking Yorkshire pudding or popovers as the forced air may cause them to end up misshapen. Try these suggestions and see if they help. It may still take a bit of practice to get the result you are looking for. 1 cup of milkAs long has you keep this rule they will work every time regardless if you use a cup or a bucket, just remember 1 cup, 1 cup, 1 cup.Only a pea size amount of fat in each muffin mould and get it smoking.Oh, and chill your yorkie mix. As for the sticking issue, I would suggest trying a silicone pudding tray. Using this they will simply fall out each and every time! 1/4 tsp salt380 and preheat 3 tbsp drippings (olive oil doesn't really work, as it begins burning at this temp)3 tbsp batter mix as described abovedon't be scared of too much oil - unused oil will remain at the bottom of the pan, and they don't stick!!! such an informtion are really feels benificial for all . I'm with Julia. I make visually award winning Yorkshire pudding but I can only get half of them out of the pan as they are "welded" to the bottom. Not to mention it takes me two weeks to clean the pan after. (soak, scrub, soak, scrub) Everytime.. I think this is the time they will fall out... on to the beautiful platter of roast beef.. and then they are stuck again. I have tried heating the pan, oil, butter, drippings, a new designer pan.. nothing helps. Help? I have no problem at all getting my puddings to rise. I get out of the oven a lovely tray of well risen popovers. And that is where they intend to stay! Does anyone have any ideas how to stop them from welding themselves permanently to the bottom of the pan please? When I tried a non-stick pan the non-stick came off with the puddings. I have tried greasing the pan with lard, oil and butter - all to no avail. Would be very grateful for any help. Thank you. My experience - I have even managed to cook them on a gas grill (sometimes) - but I have never had hockey pucks.I don't preheat the pans anymore (I used to but don't notice a difference). I use about 1C flour and 1C whole milk and 2 eggs. Also, I add about 1/2 tablespoon olive oil to the batter.The main trick is (with room temp ingredients) mix them in a blender - eggs, milk and oil first, then pour in the flour bit by bit while mixing. Mix for a good couple of minutes and take the lid off to incorporate more air in the mix. If you have to let it sit before baking, blend it again for a minute with the lid off (always start and stop the blender with the lid on as it tends to slop).Note that blending too long can substantially increase the temperature of what you are blending - so blend it a long time (2 minutes) but be reasonable. If you blend water for 30 minutes the temp will increase by 20 or 30 degrees C.Bake at 425 or 450 reducing to 425 after inserting yorkshires. My number 1 culprit: OLD FLOUR. I don't have a problem with preheating or not preheating the cooking container - but the flour can't be too old. Try replacing it if it's over 6 months or a year, check your expiration dates. How Can You Prevent a Cheesecake from Cracking? Dave Recommends "Food Lover's Companion"